The Loire Valley reflects a time when western architecture set a new standard of beauty, luxury, and scale. The region’s 300+ chateaux served as elegant abodes for French royalty and aristocrats before the French Revolution. Now a gorgeously preserved gateway, to the lives, loves, and losses that once unfolded within these grand structures, the Loire Valley boasts a living story of European history. This iconic region exudes the tragic grace of bygone gentility, making it the perfect cruise route for those captivated by art, architecture, and culture. The Loire Valley lies south-west of Paris, easily reached by TGV trains to St. Pierre-des-Corps. Spend the night before the cruise in Tours, a historic town with an abundance of gourmet bistros. 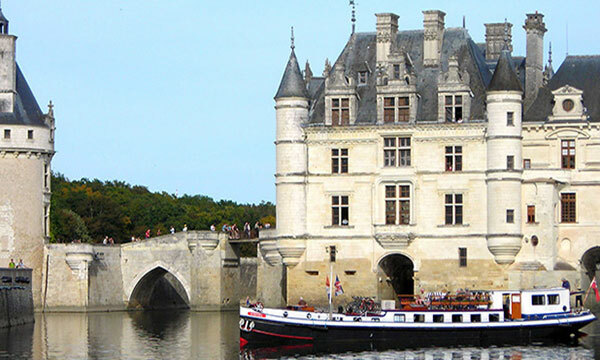 Cruise right under the famed Chateau of Chenonceau, which uniquely spans the River Cher. Visit the home of artist Leonardo da Vinci. Tour the Renaissance gardens at Chateau de Villandry. Wander through the dainty streets of a centuries-old village, perhaps discovering a lively local market or a hidden shop with hand-painted pottery. Taste the wines of Touraine. At 629 miles the Loire is France’s longest river, though not all of it is navigable. Its main tributary is the 246-mile Cher. The Loire rises in the Cévennes in south-eastern France and flows through Orléans, Tours, Angers, and Nantes until it reaches the Bay of Biscay. Why Barge in Loire Valley? What could be more extraordinary than cruising in the “Valley of the Kings”, past magnificent chateaux built centuries ago by wealthy dynasties of global influence, and designed by architectures of great distinction? The Loire Valley is as rich in legend as it is in verdant natural beauty, and fortunately, little has changed over the centuries.